Limit 1 per 2 people. May buy 1 additional as gift. Enquiries required by phone 01789297268. Booking required online at http://www.airexperiences.co.uk/GroupOn/; quote Groupon codes. Confirmation to be received within 24 hours from the merchant. Present printed Groupon on arrival. 48-hour cancellation policy. Valid Mon-Sun 9am-5pm. Bookings subject to availability and demand. Must be 14 or older. Under 18s must be accompanied by an adult. Max. weight 16st. Max. height 6ft 4”. Must be in general good health and be fit enough to fly. Not suitable for pregnant women or those suffering from high blood pressure, heart conditions, back problems, limited mobility or epilepsy. No previous experience required. Equipment provided. There is no spectator fee for accompanying adults. For information on any special assistance required including disabled access, please contact merchant directly. 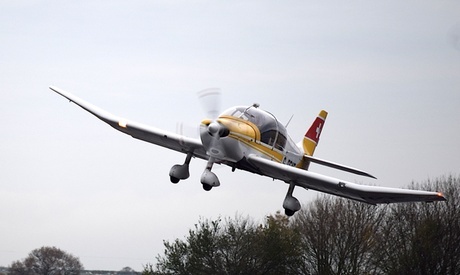 Flying is weather dependent, call before setting out to check that the weather is suitable; In the case of adverse weather booking will be rescheduled. No alcohol may be consumed prior to participation. Full Groupon value must be redeemed in 1 visit. Valid on option purchased only. Verified using our merchant’s website on 23 Nov 2015.